It's rather fascinating how Rick and Morty has continued to grow and develop into this amazing piece of culture in these modern times. It's an odd celebration of cultural memes and other pop culture artifacts powered by some crazy writing that manages to remain amazing. It's a show whose writing isn't bound by continuity and yet it demonstrates how to build up characters through crafty use of continuity. Rick and Morty is a demonstration of what pure intelligence without the limitations of stringent morality or sentiment. This is not to say that Rick is without these things, but he just doesn't allow himself to be limited by them. Figuring out what really matters to him and what drives him is probably a key point to understanding his character and the larger story at work. This has quickly become one of my favorite TV experiences and yet I know it's not exactly one that I can readily share and expect universal appeal and appreciation. 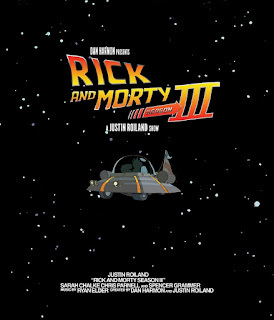 Synopsis: Rick and Morty is a adult animated television series created by Justin Roiland and Dan Harmon and airs on Cartoon Network's Adult Swim. The first the episode of the season debuted on April Fool's day with the rest of the season airing in July. The last season ended with Rick (Justin Roiland) being held in a galactic federal prison. Summer (Spencer Grammer) and Morty (Justin Roiland) attempt to rescue their grandfather but end up being captured as well. But of course this arrest is but a temporary situation for the likes of Rick. It's a question if he feels like getting out and how many idiots he wants to take down with him. One of the larger "arcs" in this season is the fact that Beth (Sarah Chalke) is getting a divorce from Jerry (Chris Parnell) and Summer and Morty all have their own ways of coping with this shift in their family structure. And it's not just bit of crying or something like that. We're talking major coping issues manifesting in very different ways throughout the season. What I Liked: Oh man where to begin with this season? The sheer gall of Rick's larger plan to really cement his place in the family is a phenomenal one and I don't think we even get to see the full scale of things - just its effects in terms of this season. But how things shift and turn as the season progresses is the real kicker here that leads to quite a phenomenal ending to things. But this is a man who was willing to turn himself into a pickle in order to avoid confronting family issues. He turned himself into a pickle. What kind of desperation does that indicate? Or is it genius? Then you get to all the references woven into each and every episode making experiencing this show one of the geekiest Easter egg hunts possible. Even the Pickle Rick episode is itself an homage to movies like Die Hard among other things and each episode is a crazy exploration of the unique cultural language that we as a people have defined over the years. What Could Have Been Better: Not every episode is amazing to an equal degree and that really depends on your interests and how well you recognize the references. But this is a minor quibble - it just makes it harder to recommend the show to other people since you can't expecting everyone to remember Romancing the Stone and other random bits of pop culture. But seriously, this season was near perfect. I don't know what else could change beyond the annoyance that it only spans 10 episodes...unless we get some sort of Christmas special or something. Fingers and toes crossed for that possibility. TL;DR: Rick and Morty is better than ever and we fans can only hope that we won't have to wait quite as long for another season to air. But at least there's a lot of material to re-explore with repeat viewings given how at times it feels like every frame of every episode has the potential for awesome geekery. And thus the season gets a full 5 crazy Rick solutions to everyday problems out of a possible 5.